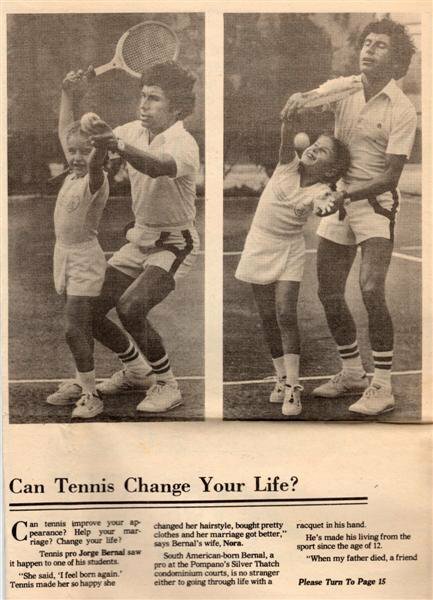 Can Tennis Change Your Life? A good friend of mine found this newspaper article of my dad and I. I remember this day clearly. The Sun-Sentinel was our local Florida newspaper. They came to our tennis club, where my dad was the head pro, to do a story on him. A photographer came with the writer and took these pictures. I remember my excitement at seeing him and his gear. I was even more excited when they wanted me to be part of my dad’s story. I remember looking at the camera instead of the ball as you can see in that first shot. I thought my dad could do all the work and I could just look straight ahead. Why would you take a picture of someone if they weren’t looking at the camera right? My dad was annoyed with me because I wouldn’t serve well, like I normally did. I didn’t care. I could serve well anytime but while the cameraman was around I just wanted to look at the camera. …..these were my thoughts…..which I still remember vividly. I was about 6 or 7. I can’t believe my memory can go back that far but I constantly can’t remember where I left my cell phone. This picture is framed in my parents bedroom. I was going to bring it back after my dad passed in January but I didn’t want to leave my mom with an empty wall. Our friend is sending me her extra copy. I’m so thrilled to have this picture in my own home. I miss my dad. Still. Terribly. When I look at my childhood pictures I have a whole new insight. As I remember my thought process I realize who else has similar thinking…P. So, I look very closely at the girl in the pictures and wonder how much P will resemble that little girl and what that now means to me as a mother.